Are you newer to the open-source community, perhaps looking to learn more? As you can see on our website, there are benefits to transit agencies in the form of more control and less overall cost to provide riders tools. Open-source is also a community, where coders can invest their time to improve transit tools to make service better and more accessible for riders. Along with our duties of keeping OneBusAway running, many of us serve as advocates for better transit tools, promoters of open and standardized transit data, and researchers trying to understand the implications of rider tools. As part of this, we are trying to create a stronger community around all of these issues, especially open-source code in the transit world. For this reason, we are teaming up with one of the other major partners in open-source tools, OpenTripPlanner to host a joint event at TRB. We’re meeting Sunday, January 13 from 11 am to 3 pm at the Marriott. We’ll also have a phone line if you aren’t attending TRB, but are interested in learning more. Contact Kari Watkins at kari.watkins@ce.gatech.edu if you’d like the call-in information. Here is an Eventbrite invitation, including the agenda. And if you are unable to attend either remotely or in person, but want to learn about open-source code and the benefits of it to agencies, contractors, and riders, please check out this link. It is from summer 2017 when one of our major contributors, Sean Crudden, and I did a webinar about the benefits of open-source code. The Map Table: an easy way for riders to see all of the transit stops around them. Agency Alerts: a simple way for transit agencies to share breaking news. Siri Shortcuts: a quick way to access most-used transit stops. 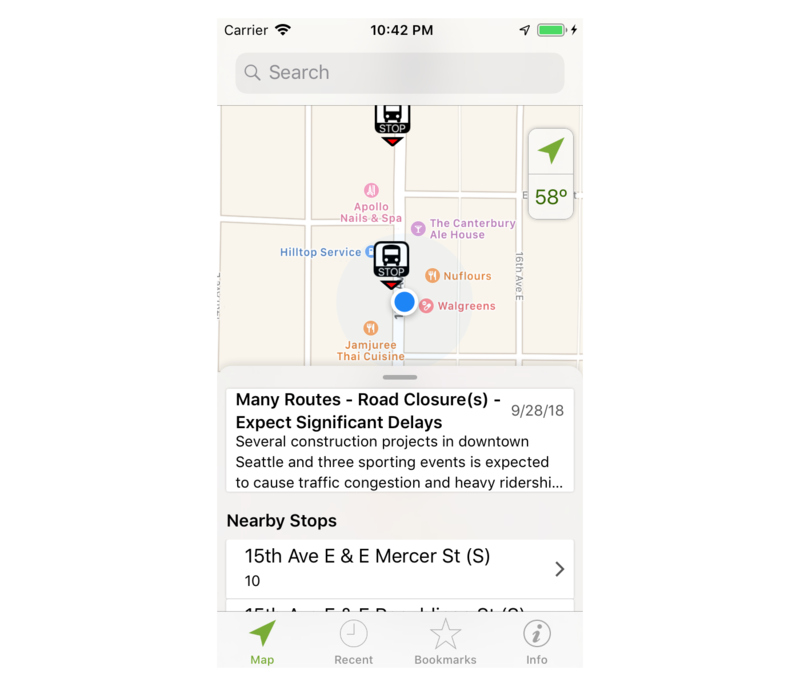 Siri works with OneBusAway to learn the rider’s favorite transit stops so that it can automatically recommend them from the lock and search screens. Of particular interest to transit agencies may be the Agency Alerts feature, which allow agencies to quickly publish short, region-wide alerts that are then shown directly inside the Map Table in the app. This feature is currently available only on iOS, but we are planning on adding it to Android as well. Agency Alerts are implemented in compliance with the standard GTFS-RT specification. In addition, for agencies that don’t (yet?) publish region-wide GTFS-RT alerts, and for cases when the OneBusAway server in a region is down and that needs to be communicated to riders, we have also provided an alternate mechanism for publishing these alerts via alerts.onebusaway.org. Please see Aaron’s blog post for a complete description of these new features. As always, OneBusAway for iPhone is available for free from the App Store, and the source code is on the iPhone app section of our GitHub repository. This release took longer than expected, mostly because I kept adding stuff to it. But, I think it’s worth the wait! OneBusAway 17.4.0 adds alarms to tell you when your bus is a certain number of minutes away, a new search experience, and a huge amount of polish. When a serious issue happens with the bus system, you’ll receive an alert as soon as you open the app that gives you more information about it. This way, you’ll never get caught off guard by salmon trucks or snow days again. Please note: I am currently manually adding this data to the system, so early morning commuters might not get to take advantage of it. Just a head’s up. You can view more alerts from the Info tab. These are things like one-off cancellations of routes. Set an alarm for a particular bus and get a push notification on your iPhone or Apple Watch when your bus is your specified number of minutes away. Tap on a ‘…’ button to access bookmarking, trip sharing, and alarms. 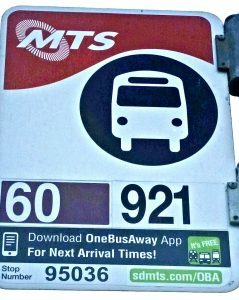 Move walking distance and time into the stops table so you can see exactly which buses you’ll be able to catch. A huge “thank you” to Edgar, who continues to volunteer his time to localize OneBusAway into Spanish. Lots of behind-the-scenes upgrades to OBA, including model and networking layers. Additionally, in Puget Sound only for now, you’ll be able to get alerts about major failures in the bus system, like when an overturned fish truck snarls the evening commute! Hey transit agencies, feel free to get in touch with me about adding your data to this new system.